'Cold hands, warm heart'? - hand temperature basics & new research! 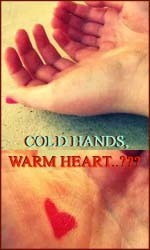 New research indicates that the old saying 'cold hands, warm heart' may not be true at all! The basics about hand temperature - including: the normal temperature distribution in the human hand, poor circulation in the fingers, and the consequences of Raynaud disease. � 'Cold hands, warm heart' - new research points out: the reverse is true! Last year US researchers found that the temperature of our hands has a very significant impact on how people value and judge social situations - the new research indicates that the old saying 'cold hands, warm heart' may not be true at all! Let's take a look at some hand temperature basics, including: the normal hand temperature distribution, the effect of nicotine & alcohol, and a more serious health condition related to cold hands: Raynauld's disease. 'COLD HANDS, WARM HEART' - new research points out: the reverse is true! A few months ago, Lawrence Williams, PhD (assistant professor at the University of Colorado at Boulder), and John A. Bargh, PhD (professor of psychology at Yale University) published the results of two studies on how hand temperature affects the emotions of undergraduate students. The researchers found that holding warm things may actually make people view others more favorably (in terms of social warmth), and having warm hands may also make people more generous. In the first study the reseachers presented half the unwitting participants (41 college students) with a hot or ice cold coffee and then asked what they thought of a stranger after a brief meeting. They found that holding a hot cup of coffee led people to judge the stranger to be a "warmer" person, in terms of traits such as generosity and kindness, compared to a group of people who held a cup of iced coffee. In the second study the researchers had people, who thought they were evaluating a product, hold either a warm or cold object - hot pads or cold pads as used in muscle therapy- and then given a choice of reward for participating in the study: either a gift for a friend, or a reward for themselves. The study found that people who held the hot pad (which results in warm hands) were more likely to choose the gift for a friend, and people who held the cold pack were more likely to choose the reward for themselves. "Physical and psychological concepts are much more closely aligned in the mind than we have previously appreciated. Other research has found that the same brain region that processes physical temperature changes, called the insula, also processes feelings of trust and empathy associated with social warmth." "It appears that the effect of physical temperature is not just on how we see others, it affects our own behavior as well. Physical warmth can make us see others as warmer people, but also cause us to be warmer - more generous and trusting - as well." In 1998 a Japanese study (reported via nirs.go.jp) revealed that females subjects (32.4 degrees) had a significant higher hand temperature than male subjects (31.8 degrees). What you should know is that nicotine in cigarette smoke is a 'vasoconstrictor' - which implicates that the effect of smoking will be that it causes the hands of smokers to become cooler! In the perspective of the US research presented above: this knowledge definitely presents another motive for smokers to quite their unhealthy habit!! On the other hand alcohol is a 'vasodilator' and so the consumption of alcohol will cause hands to become warmer. Sound like a good motive for a 'social drink'?? Actually, not quite! For... the warming of your hands will lead to cooling of your body so the truth is actually: be careful with drinking alcohol!! Cold hands can be the result of a rich number of causes, starting with: feelings of stress, or bitter weather. Chronic cold hands and fingers (even in warm weather/warm room) can sometimes be the result of a series of medical conditions, including: heart disease, peripheral vascular disease, arthritic disorders, chronic fatigue syndrome (ME), or circulatory disorders. Wrongdiagnosis.com presents a list of 22 causes of cold hands. However, the most common cause of (painful) chronic cold hands is: Raynaud's disorder, or: Raynaud's syndrome. The symptoms of this rather serious medical condition may vary widly from: "just" numb hands, to being unable to use the fingers at all, up to the feeling as if glass is being scrunched in your hands. 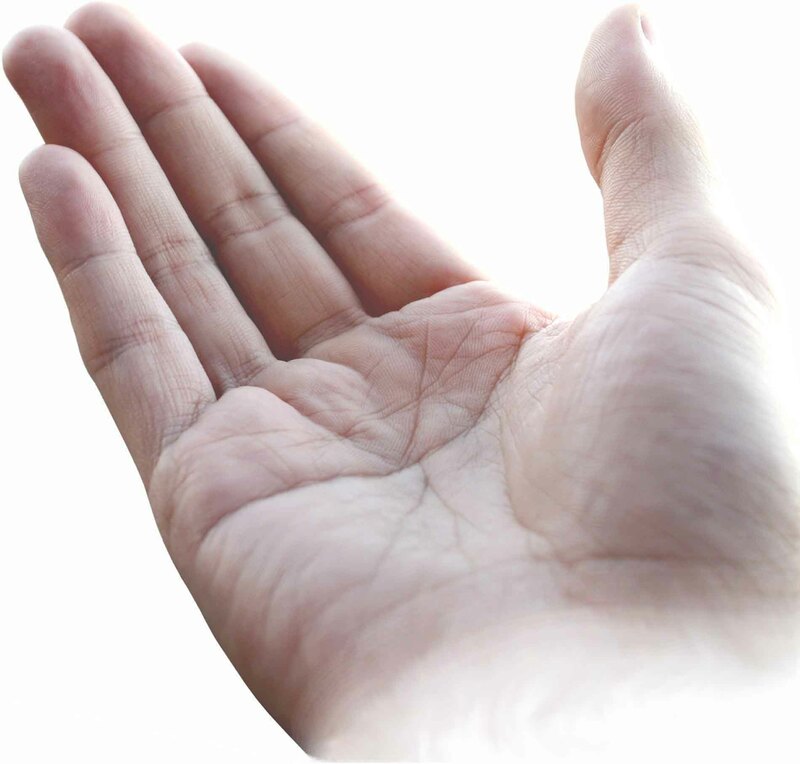 People who have Raynaud�s syndrome have unusually reactive blood vessels in the hands. In response to even mildly depressed temperatures, the hands and fingers may become cold and numb and even manifest color changes ranging from white to purple. This can occur sometimes with something as simple as touching a cold object for a few seconds. Although the exact cause of this syndrome isn�t known, it�s believed to inflict up to fifteen percent of the population to some degree with women being more commonly affected than men. 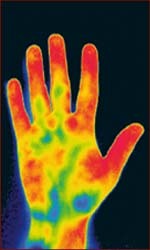 Thermography of a patient with Raynaud's syndrome. The picture above presents a thermography of a patient with Raynaud's syndrome: indicted by the blue coloured fingers; the picture below presents the thermography of a subject who doesn't suffer on cold hands/fingers: indicated by the red fingers. Thermography of a normal patient (see also the first picture in this article). The exact etiology (biological/gentic cause) of Raynaud's syndrome/disease is unknown - though sometimes the symptoms can be related to an underlying primary medical cause. Whether you experience cold fingers and hands from chronic nervous or from Raynaud�s syndrome, it�s important to avoid making the problem worse. Stress management is usually a good first step - in order to keep the nervous system from constricting blood flow to the hands. � To quit smoking is a secondary strategy. � To avoid tight or constrictive clothing on the upper body. � In cold weather, to cover your hands and fingers with a good pair of gloves. � Be aware: cold hands can be a side-effect of certain medications (such as migraine treatments, betablockers and the Pill), and/or exposure to chemicals or a virus! � In some cases, medications known as calcium channel blockers are used to treat cold fingers and hands associated with Raynaud�s syndrome. In general, when you�re experiencing other symptoms with your cold fingers and hands, it�s usually a good idea to see your doctor to rule out more serious medical causes - mentioned earlier in this article.